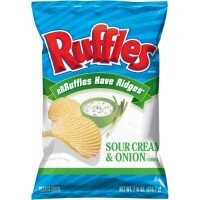 You can skip the french onion dip when you buy a bag of Ruffles Sour Cream & Onion flavor! 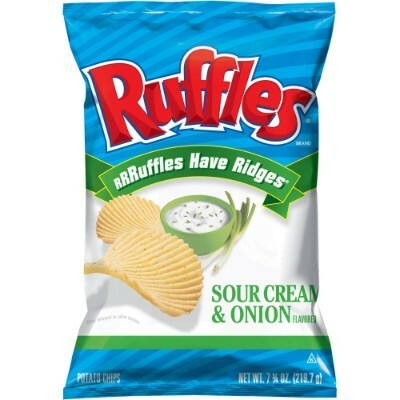 Ruffles takes the recipe for their quintessential crispy golden potato chip, then they take it up another notch with the savory and satisfying flavor of rich sour cream and flavorful onion! This bag is perfect for sharing (if you’re into that sort of thing). Potatoes, vegetable oil (sunflower, corn, and/or canola oil), sour cream and onion seasoning (whey, skim milk, onion powder, salt, natural flavor, sour cream [cultured cream, skim milk], maltodextrin from corn, maltodextrin from potato, buttermilk (milk), flavor enhancer E621, spices, yeast extract). contains milk. Contains GMO. Nutrition facts (for 100g): calories 536Kcal, total fat 35.7g (saturated fat 5.4g), total carbohydrate 53.6g (sugar 7.1g), protein 7.1g, salt 1.3g. Ces chips sont supers bonnes , croustillantes à souhait et le goût est bien présent et ne fait pas “chimique “ . Vous commencez le paquet et pas le temps dire our et il n’y en a déjà plus ahah !